This blog will share with you some of the most common ‘gaps’ we see when customers come to us to create their product lines. After 20 years, we’ve seen a lot, and believe me, most of them are not obvious or even what common sense would tell you to do. The list we have compiled below was gathered from talking with our account executives, our production teams, our marketers, and our formulators. The hope is that you’ll find at least one ‘ah ha’ idea to help you more smoothly bring a new product or product line to market. 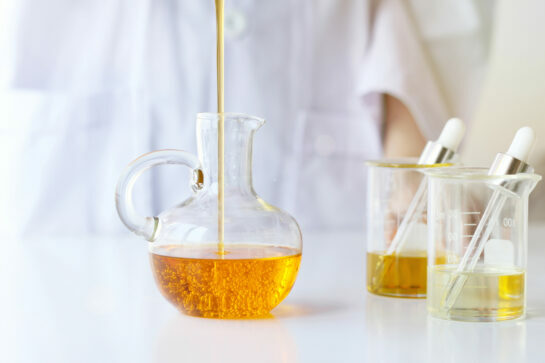 If you have an idea for a product — perhaps even the ingredients you want to use — but don’t have a formula — our R&D team can step in to help you develop a completely custom formulation. This is true, too, if you love a product someone else has on the market and you want to do your own version, improving or changing it to meet your desired outcome. We will first want to know if you have a benchmark. A benchmark is a sample of a product you want your product to emulate. Maybe it’s a product you buy at Credo or maybe it’s something you’ve been trying to formulate yourself. Or perhaps you have no formula at all, but just a clear vision. All of that is okay. REALITY CHECK: Be prepared for multiple prototypes. Realistically, bringing a totally new formula to market can take a year or more. You’ll want to plan for market testing and challenge testing. REALITY CHECK: Using stock products — like Essential’s Sirius Line — is a great way to get to market quickly. Put your energy into branding, marketing, and at the same time, be creating your hero products to bring to market once you have an established customer base and reputation.